Plug plants are young plants grown in jiffy-7 pellets. 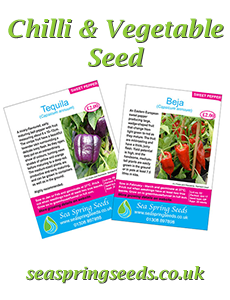 They are sown in January or February, and will be ready for potting on when sent out in April/May. 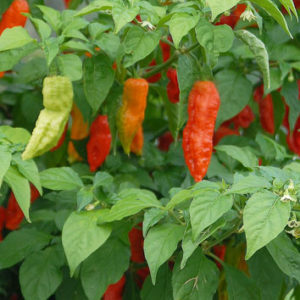 The ‘superhots’ are habanero chillies that measure over half a million Scoville Heat Units (SHU); and given the right environment some are capable of reaching heat levels in excess of a million SHU. These chillies must be treated with great care and respect. We have three rules: never dare, never bet and NEVER trick someone into eating a superhot chilli. Order now; delivery early May 2019. 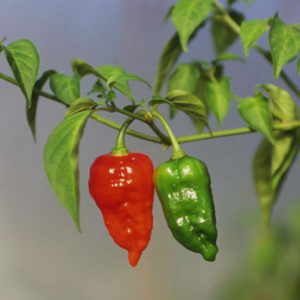 A prolific superhot chilli producing pale green, almost white, fruit that ripen to a red. Strong, bubblegum-type flavour. 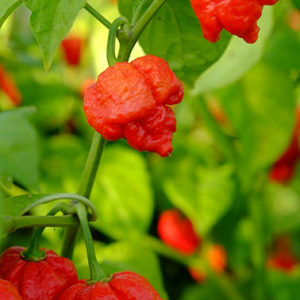 Dorset Naga has a scorching heat, combined with a distinctive fruity aroma, making this a truly exceptional chilli. Plants can be extremely productive. Fire by name, and fire by nature… need we say more? 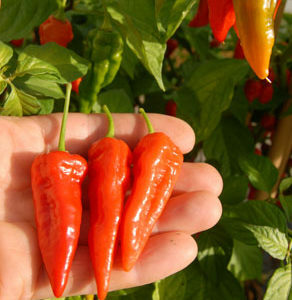 Originating in Suriname, this superhot chilli has wrinkled, elongated fruit that are wide at the shoulder, then quickly taper down to a point. A legendary superhot that lives up to its reputation ­– with fruit measuring a life-threatening 1.12 million SHUs. And if you can get past the heat, the smell is great, too.